The discussion regarding to the film has centered around the non-monster sequences and the fact that everyone in the film are politicians. People are having trouble with the film being centered on the political response to Godzilla’s attack. They wanted a military focused film because that would move the film. They found the politics so deadly that one of the people I went with fell so soundly asleep that his snoring produced laughter in the theater. The way the film is structured is that it begins with news/found footage of an incident in a tunnel across Tokyo bay. The film then switches to politicians dealing with that . 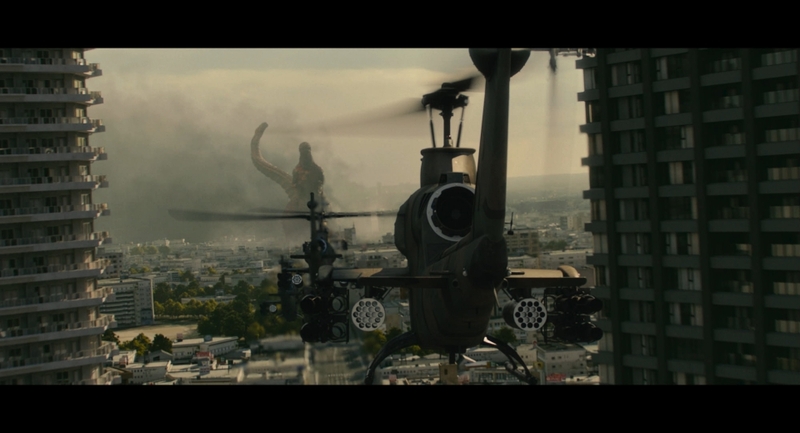 We then cut back and forth for the next 20 or 25 minutes as Godzilla emerges and the government tries to deal with it. The monster leaves and for the next 20 or 25 minutes the government tries to come up with a strategy to deal with the prospect of a reappearance. There is another attack which leads into a discussion of how to stop the beast, before the final assault. Much of the final 45 minutes is not full on action of the stomping variety but political maneuvering to prevent the US from nuking Japan. The film was made for the Japanese audience with an eye toward providing direct commentary on the Japanese handling of Fukushima and the related tsunami. The result is a film that plays well as commentary of any government handling some sort of disaster. It’s also a wicked satire of political maneuvering as the various ministers try to jockey themselves into power as events remove them. The trouble at the screening I attended is it didn’t play all that well people wanted Godzilla to just stomp. While that’s here in several sequences that brought audible gasps from the audience, the rest distanced them. People found the talk confusing, didn’t like the characters and thought there were too many people in too many talk sequences. They hated that we sided with politicians. I’m not sure what they were expecting. I think the problem with the film is that people’s idea of what a Godzilla film is not what the films really are. I was always puzzled why film reference books always rated the films lower than I would have based on my memory. Then I actually rewatched them- and found most really aren’t that good. I’m not sure that most people really realize that in the original series, before they restarted in 1984 that there are long dead spots in almost all the films. Godzilla and the other monsters are just sort of brought in at the end. As much as I like the films the thought of actually sitting down and watching them with no distractions from start to finish makes my toes curl. The films are plodding dramas with monsters in them. Listening to two guys argue that the original films were better made me laugh because they clearly hadn’t sat down and really watched the films without doing anything else. The films are awful outside of the monster parts- which is why you only remember the monster parts. Time wise Shin Godzilla actually has more action than most of the original series. While some of the series that started in 1984 may be more action packed they aren’t all that good either past a certain point. That series became a series of monster battles and little more. Yea I love the battles but the films themselves are cheesy- fun, but cheesy. Which is why I responded to Shin Godzilla’s intelligent talk. Like 2014’s American Godzilla Shin has a brain in its head. We are not just watching monsters beat each other or beat on puny humans. There is more going on, themes and ideas. I like things operating on a higher level. On the other hand some people don’t and I watched a two guys argue which of the two most recent films was worse- Shin because it has talky spots or 2014’s Godzilla because you don’t see the monster fully and the camera cuts away to follow the characters. It was a very funny discussion. I asked which film they liked best and they said the original film followed by Destroy All Monsters because it was all monsters. The rest of the reaction Tuesday night was across the spectrum. Everyone loved the monster stuff and their reaction to the rest depended upon whether they got what the film was doing or not. If they didn’t get it or didn’t care they hated the film. Seeing the film big, with an audience I realized that I probably shouldn’t have said that everyone should go. I should have reconsidered that. What I should have said is that if you want to see a very good monster film that is more than a monster film or if the monster stuff really big by all means go to the film during its limited run- if on the other hand you don’t want to see the talk and just want to see the good parts wait for home video when you can jump to the good parts and scan through the talk.